Looking to add a protein punch to your morning meal? Try out these flapjacks, which combine the dual superpowers of protein and peanut butter into one glorious pancake experience! Who doesn't love waking up to a heaping stack of pancakes? They're the ultimate morning comfort food. This recipe for everyone's favorite breakfast staple offers up a little something extra: a hearty dose of protein! 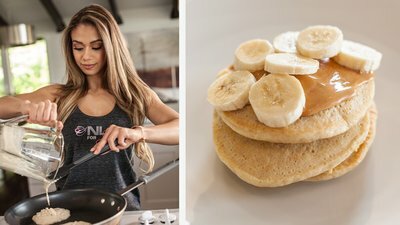 I love this recipe because the combination of banana, peanut butter, and vanilla-cupcake protein makes it a dessert-like treat that meets my macros while satisfying my sweet tooth. I usually use bananas and peanut butter, but feel free to dress these hotcakes with any topping of your choice. Strawberries, blueberries, sugar-free syrup, and even a little yogurt make for delicious pairings!